Holly is one of the most popular broad-leaf evergreens. It’s deep-green glossy leaves look great in the garden all year round, and the winter bonus of bright red berries really brings color and interest at a low time in the garden. Plus, it’s traditional for the holiday season, so you can make your own wreathes and garlands to brighten your home. For hedges or specimens, these reliable plants get a 5-star rating. The only problem is, the different kinds of hollies vary a lot in winter hardiness. If it is too cold for them, then the leaves will burn and dry, and stems may die too, making it hard or impossible to get the results you want. So when you choose which varieties to plant, an important consideration is the zone you live in, and the hardiness of the trees you are looking at. If you live in zone 6 or warmer, you can choose almost any of the hollies, and winter-damage will not be an issue. This problem mostly affects gardeners in zones 4 and 5, so let’s look at those zones, and see what the top-choice holly bushes are for those colder areas. If you live in zone 5, with winter lows going down to minus 20 degrees Fahrenheit, you have a lot of choices, so it won’t be hard to find a cold-hardy holly for your garden. 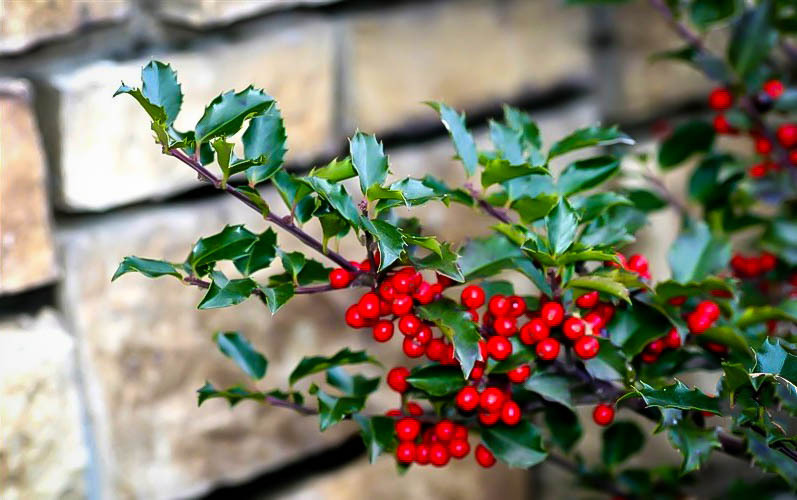 The English Holly (Ilex aquifolium), is not hardy below zone 6, and the best choices for zone 5 are Japanese Holly (Ilex crenata), American Holly (Ilex opaca), and the Meserve hybrid hollies. Since some of the plants in this last group is hardy in zone 4 as well, we will consider those later, and focus on the first two for the moment. Just as with boxwoods, Asian species of holly are tougher than their European relatives, so wise American gardeners in cooler areas turn to them for help. Japanese holly grows in Japan, China and Korea, and is different in appearance to other hollies, because the leaves are much smaller – small enough that it is often called the box-leaf holly. With those smaller leaves it is ideal for smaller specimens and hedges, leaving the bigger hedges to other forms. It does have berries, but sadly these are black, not red, so they don’t make a conspicuous winter display. The Japanese holly is a little variable in hardiness, so it’s a good idea to select the variety you use carefully. This plant is very variable in form, ranging from small, rounded and low shrubs to striking narrow, upright specimens. Here are some forms suitable for zone 5. We think of ‘holly’ and ‘spiny leaves’ at the same moment, but this dwarf selection of Japanese holly lacks spines, which is why it has this name. It forms a dense, rounded shrub with spineless leaves a little less than an inch long. It grows 2 or 3 feet tall, and the same size across, so it makes a lovely small mound for planting among smaller shrubs, or a low hedge to edge a bed. Even unclipped it is dense, but of course with clipping it will be even denser and neater. To show how variable Japanese holly is, this plant grows 8 to 10 feet tall, but never more than 2 or 3 feet across. It’s great as a narrow column for an accent, growing well in sun or shade. Because it is so narrow, it is ideal for that special problem of the suburbs and town houses – privacy from a neighbor just a few feet away. Planted 18 to 24 inches apart, its easy to create a thin screen in an area just a few feet wide, with enough height to screen ground-floor windows completely. Since it thrives in shade the building shade in these narrow areas is not a problem at all for this plant. It can be clipped to an even narrower profile, but for low-maintenance neatness, its hard to beat. This handsome shrub grows 15 to 20 feet tall, and as least 12 feet wide, in time, so it is a popular choice for hedges and large specimens for screening. It forms a dense shrub, and can easily be clips to become even denser, and it has the added benefit of producing lots of red berries in winter. It is much tougher than many other hollies, thriving in urban conditions, poor soil, drought and poor drainage. There are few situations where this shrub won’t do well, so plant it with confidence, in full sun or partial shade. Even deer usually leave it alone. If you are in zone 5 in an exposed location, American Holly may suffer some winter burn – it does best in sheltered parts of this zone, so it may not be your ideal choice in a windswept, open garden. For tougher choices, turn to the Meserve hybrid hollies. Kathleen K. Meserve was an enthusiastic 20th century amateur gardener who had a 10-acre garden in St James, Long Island. She loved holly and wanted to create very hardy hollies that had red berries. She used an obscure Japanese species – Ilex rugosa – to create hybrids with the English holly and got what she wanted. The hybrid is called Ilex x meserveae. The foliage of these plants is such a dark green that it can look bluish, so they are often called Blue Hollies, and all the names of her original hybrids contain the word ‘Blue’. Because she was so fond of those berries she carefully matched up male and female trees to give the best crops. If you love them too, pair up ‘Blue Princess’ with ‘Blue Prince’ – you can guess which one has the berries, yes? Actually, all the male blue hollies make good pollinators, and a choice like ‘Blue Maid’ for a female will work just as well. You need one male for every 4 or 5 female trees, to get a bumper crop. ‘Blue Maid’ is also one of the best an biggest of Mrs. Meserve’s trees, reaching 8 or 10 feet in height, and 6 feet or more across – plenty big enough for a sturdy hedge. Because of that bluish tone in the leaves, in the 1990s a breeder in Germany took some of those original trees and crossed them back with plants of the European holly to get greener leaves. He got some great plants, completely hardy in zone 5, and so ideal for that area. Two of the best are Castle Wall Blue Holly – a male tree, and Castle Spire Blue Holly – a beautiful female tree with loads of red berries. These German hybrids are very vigorous, growing to 8 or 10 feet tall, and you can plant Castle Spire, with a few Castle Wall thrown in, and get a terrific informal screen with loads of winter color, and a dense, formal hedge with a couple of clips a year. If you live in zone 4, your best choices are simple – the Meserve Hollies with the original ‘Blue’ names of Mrs. Meserve. The German hybrids have more European Holly in them, and they are not as hardy. If you stick to those originals, you too can enjoy the beauty of holly in a zone 4 winter – just like everyone else.